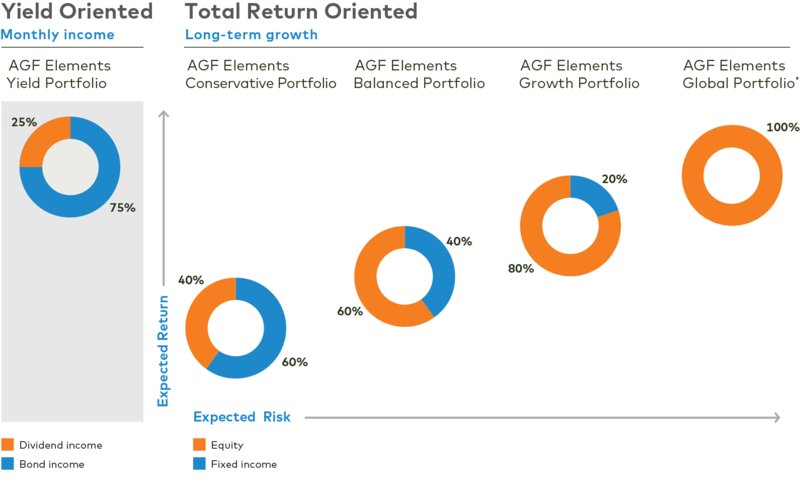 AGF Elements Portfolios – Offer built-in, multi-layers diversification with ongoing monitoring designed to minimize risk and provide more consistent returns. Five distinct portfolios aligned against investors’ objectives, time horizons and risk expectations. Each portfolio optimally constructed, combining a blend of equity, balanced and fixed-income funds, different styles and exposure to economic sectors to afford maximum diversification in one simple and actively managed solution. Overview of the Asset Allocation Committee and its process. Quarterly outlook and model portfolio recommendations. 10 reasons to consider Elements as your core investment, taking you from accumulation phase to retirement. Help your clients choose the right investment to meet their needs. Provides a quarterly update on the Portfolios’ allocations and underlying fund holdings.